Personalize your tags so that people will see where they bought that great gift. 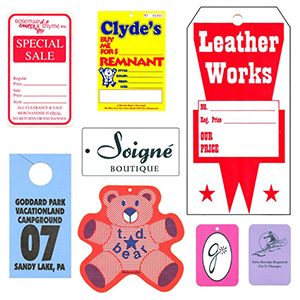 Add a perforation so you can tear off any pricing information on the tag. Pick the tag size, let us know what you want on the tag, and we'll do the rest! We've added 5 exciting new fluorescent tag colors: RED, ORANGE, PINK, GREEN, & CHARTREUSE. The other available colors are Yellow, Pink, Buff, Light Green, Purple, Light Blue, Orange, Ivory, White, Dark Green, Brown, Gray, Dark Blue. Call for samples. *1 1/4 x 1 1/2 *2 x 2 1/2"
*2 1/2 x 2 1/2"
Plate charge $40.00. Add $20.00 per order for ink color other than black. Add 15% for fluorescent tags. Price includes printing one color on one side.